kula shakerz 2014-01-27, 17:15 pm. 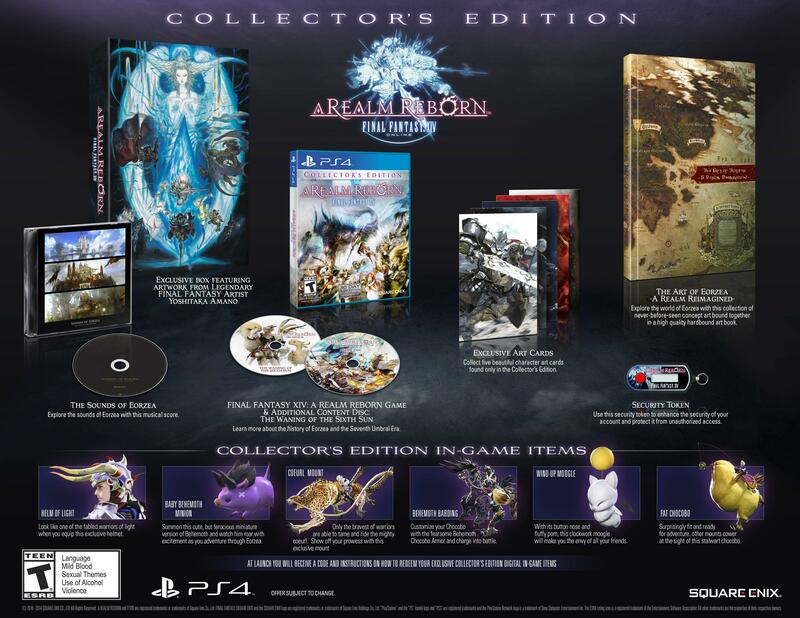 PC and PlayStation players who already own a registered copy of the collector's edition for Final Fantasy XIV or Final Fantasy XIV: A Realm Reborn will be able to get the two in-game items (Fat Chocobo Mount & Wind-up Moogle minion) for free. PlayStation 3 players will also be able to upgrade their account to the PlayStation 4 version at no cost starting on April 11th. Players who chose to do so will no longer be able to play on the PlayStation 3 version of the game. More details regarding the upgrade process will be made available as we get closer to launch. I wish I could buy all the art books that they include in the collector's editions separately. Yes that would be awesome. There are many games I have no interest in buying but where I really like the art. Wasn't that a summon in Final Fantasy VII and VIII? And a crappy one too if I remember correctly. The behemoth chocobo gear is absolutely amazing looking in the game, and so is the magitek mount from the PC CE. Magitek is part of the story, everyone (eventually) gets one. EdIt - Quit playing around with that Sounds of Eorzea CD and release the full OST, Square!